I left my country to prove that the deaf can speak English, too. 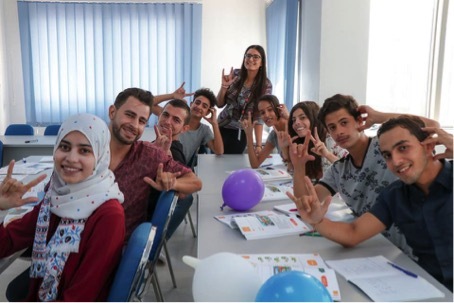 Working with minority groups and working on the educational development of the deaf and hard of hearing community was a tough row to hoe in Tunisia, especially when you don’t have any official statistics on hand or any information that can help you. 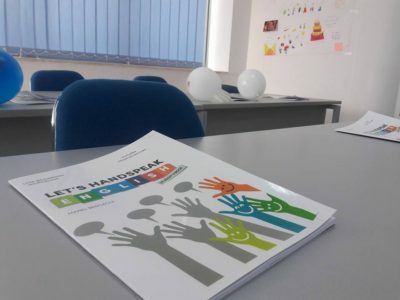 I have written a list of things that can be done by deaf people like any other person in this life, yet the focal point is that the deaf can speak English, so comes the idea of my project “Let’s Handspeak English”. Being the first and only teacher of English, who teaches English with Tunisian Sign Language, was not enough. Especially since materials don’t exist to teach with. My project was to create an English book designed for the Tunisian deaf and hard of hearing community and start using it in class. Thanks to legacy international and through Professional Fellow Program I discovered myself. I learned how to work under stress and I forgot the word “routine”, for each day is a new beginning; you see new people, learn new skills, and discover new attitude. It is a rich program per excellence! I had the chance to work in different places (Gallaudet University and National Association of the Deaf). I met and interacted with people from distinct countries with diverse culture. This social intercommunication has enlarged my worldview. While I had prior yet limited work experience in Tunisia, I got a real feel of real world of work. What I admired most was their professional attitude and the concept of working according to time just overwhelming! When I went to Gallaudet University, I couldn’t express my feelings! It was the university that I read a lot about. What a feeling when you meet professors you read a lot about them and their books, but they don’t know. You feel like you know them very well, but they don’t. At a first time, I thought I won’t be able to communicate with them because of sign language difference. Luckily, this was not the case. I was impressed by the professionalism that the deaf community has, too! I am very grateful to deaf and hearing American people for their warm hospitality and opening doors of their homes and hearts. I gained a lot from professionals, teachers, as well as deaf people there. They gave me the opportunity to enhance my professional skills and to experience a new work environment. It has been one of the best work experiences ever! Being in a direct contact with the American deaf community was very enriching and enabled me to gain a thorough understanding of the deaf culture in the USA. It was interesting to be not only part of the American people but also of the deaf community. I never thought that I would be able to do so much in such period of time, but the most amazing thing is that the cultural experience is limitless and language barrier is never an obstacle. You just have to be confident and believe in yourself no matter what. “Let’s Handspeak English”, sponsored by legacy international, is my follow-on project. It is the first and only English book designed to the Tunisian deaf community. This project is the first step of a whole process. Learning the English language is a dream of many deaf persons in my country and thanks to this book it is easier for them to learn and understand the language. The project was in collaboration with Amideast, Tunisia and the target group is from Association Voix de Sourds de Tunis (AVST). A group of young motivated deaf and hard of hearing students were present in each session. They started to learn the English language through this book and in a well-equipped classroom. At first, they couldn’t believe their eyes; an English book created according to their needs! They were enthusiastic, excited, ready to serious work, disciplined, hardworking, and the most important thing they felt EQUAL. Their happiness was inexplicable. I understood the real happiness through their eyes. I have been always asked “why do you teach the English language to the deaf persons?” Because the Deaf Can (DC), I reply. Why not! If they are supposed to be equal they have to! English is not only a language, but also one of the most spoken languages in the world and learning the language will open doors for them in the future. In fact, working with the deaf people wasn’t easy for the first time, but it was the best choice I made in my life! I learned a lot from them, especially PATIENCE. The result shows the success of the project as they started to read and write in English! Their motivation and dedication towards learning the language shows the need to change and we are here to make this change!